Since I was 15 years old, our family try to observe vegetarian diet on each new and full moon day of the Chinese lunar calendar. When I was in university, I joined a friend of mine to observe vegetarian diet for 9 days each year during the 9th month of the Chinese lunar calendar which is of the 9 Emperor God’s festival. For 2017, the first day would commence on Friday, 20 October 2017. Some Chinese would observe 9 days of vegetarian diet. My Indian and some Thai folks would also observe vegetarian diet around this time. Personally, I find the 9 days vegetarian observation diet to be helpful in building willpower and focus, hence it is a practice I try to continue throughout the years. I have been a vegetarian at certain periods of my life ….and one thing is it does help me to control my temper (I used to have a very bad temper). Without meat, somehow there seemed to be no ‘fuel’ to help spark the raging fires of anger. When I came out to work, I used to have a few Indian friends who also observe vegetarian diet around the same time (but not on exact dates) so it is quite nice for us to encourage each other. 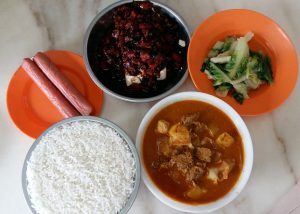 In the past, I used to buy vegetarian dishes- however I noticed the price is expensive and often oily and MSG laden. Lately, I have prepared my own vegetarian dishes using premix, mock meat and fresh ingredients from the market. 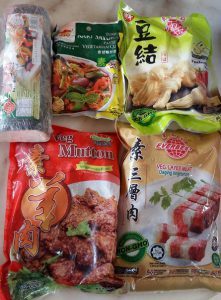 Above are some of the vegetarian mock meat that I buy and stock up in my freezer. Except for vege fishballs, I don’t really fancy mock meat but other members of my family prefer mock meat. Anyhow, I do try to add a lot of vegetables in the cooking like ladies fingers, cabbage, carrots and potatos and reduce the mock meat usage. On a typical full moon/new moon day that falls on weekends I would cook usually 4 to 5 dishes. If it falls on a weekday, I would fried some vegetarian fried rice in the morning then cook about 3 dishes in the evening. 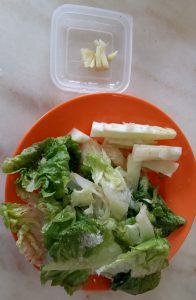 Sometimes I wash the vegetable the day before, drain the water and put in a plastic container in the fridge so it saves time when I want to cook it. 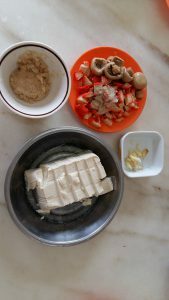 Ingredients: Soft tofu (from the market), minced salted vegetables (need to soak and wash a few times as it can be salty), ginger, canned button mushroom or mushrooms and mock char siew. I would cut up the tofu as shown below and steam while I can cooking the rice in the rice cooker. Then I would stir fry the ginger, salted vegetables, button mushroom or mushroom and mock char siew and then mixed with dark soy sauce, vegetarian oyster sauce. Also salt, sugar and pepper to taste. I would also thicken the sauce a little with cornstarch. After that I would take out the steamed tofu, drain the water and then pour the sauce on it. I have not learnt how to cook curry so I would always buy the vegetarian curry paste from the market. 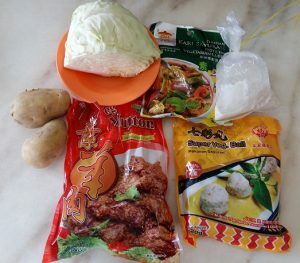 Below are some of the ingredients that went into cooking my vegetarian curry: vegetarian curry paste, mock lamb meat, mock fishballs, potatos and coconut milk (santan). Sometimes you can add in brinjals, fried taufu and ladies fingers as well. The instructions to cook is behind package- for one packet it would require about 1.2 litres of water (don’t put too much water as it may make the curry not thick enough). Basically just boil the water and then put in the paste, followed by the ingredients- place those that take longer time to cook like potatos first. Once it is ready, pour coconut link, stir for a short while and off the fire. In order for the dish to taste delicious you must use coconut milk (santan) either the fresh one from the market or the prepacked (comes in liquid or powder form). Without the coconut milk, the curry taste horrible. I usually keep an extra packet of coconut milk (which I buy from the market for RM1 for a small packet) in my freezer and defrost it when I need to cook curry. I would dish out half the curry from the pot to eat for lunch and the remaining I leave it on the pot undisturbed and then reheat again during dinner. For unfinished curry for lunch, I would not pour back to the pot. I managed to find vegetarian sausage and I sometimes would roast them in the oven (apply a little oil at the tray) at 190 degrees for 15- 20 minutes. Below is the overall dishes. My cooking still needs a lot of improvement. However, I turned to below after I find the store selling Chinese vegetarian dishes where the cooking is too oily and the conditions does not look too hygienic. 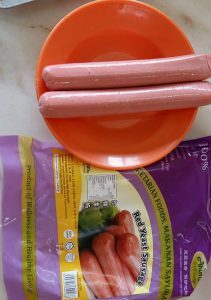 Also by cooking myself I am able to add more of my favourite ingredients (like vegetarian fishballs) and omit certain ingredients that I do not like. For the 9 days, since I am the only person in my house on vegetarian diet, I would adapt by cooking one or two vege dish for myself and another non vege dish for the family. As I am not a good cook, certain meat dishes I would not cook as I am not able to try the sauce (good cook like my Muslim friends who are cooking during fasting month can still cook delicious tasting food without needing to taste the food which I am really amazed). I may buy or just stick to those which does not require trying out the taste.